A urinary tract infection (UTI) is an infection of the urinary tract. This article discusses UTIs in children. The urinary tract is where our bodies make and get rid of urine. It comprises the kidneys, and stretches out to the ureters (the tubes connecting the kidneys to the bladder), down to the bladder, and finally the urethra (the tube that carries urine out of the body). 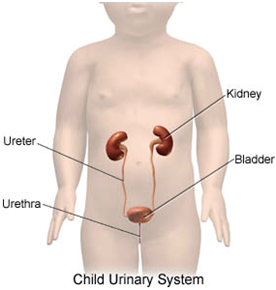 Most urinary tract infections in children only involve the bladder. If the infection spreads to the kidneys (called pyelonephritis), it may be more serious. Most childhood UTIs will clear up within 24 to 48 hours of treatment with antibiotics and won't cause any long-term problems. In many cases, treatment will involve your child taking antibiotic tablets at home. For lower UTIs, a three-day course of antibiotics is usually recommended. For upper UTIs, a 7 to 10-day course of antibiotics is usually recommended. Encourage them to rest more. If your child has a problem in their urinary tract that increases their risk of UTIs, such as faulty valves that allow urine to flow the wrong way, they may be prescribed low-dose antibiotics as a long-term measure to prevent further infections. 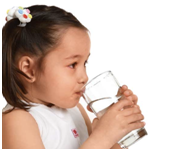 Young children have the greatest risk for kidney damage from urinary tract infections, especially if they have some unknown urinary tract abnormality. The damage can cause scarring, poor growth and abnormal function of the kidney as well as high blood pressure and other problems. For those reasons, it is imperative that your child be evaluated carefully and treated promptly. A urine sample is needed to diagnose a UTI in a child. The sample is examined under a microscope and sent to a lab for a urine culture. It may be hard to get a urine sample in a child who is not toilet trained. The test cannot be done using a wet diaper. To prevent recurrent UTIs, the health care provider may recommend low-dose antibiotics after the first symptoms have gone away. "Do less, Stimulate less, Speak less, Eat less." "Drink more, Sleep more, Rest more, and Breathe more." 1) Stop your daily routine and encourage your child, and your family members, to rest. 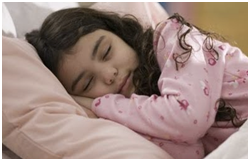 2) Provide a safe and comfortable environment for your child to process the illness. 3) Encourage plenty of fluids (water, tea, broth, soup, and breast milk). If your child is on formula, you may need to either stop the formula completely, or feed fewer ounces through the illness. 4) Turn the volume down.... Reduce activity levels, noise, excitement, schedules, chores, and tasks to a minimum. 5) Turn the lights down. Maintain a calm, quiet, peaceful environment for your child's nervous system to heal. 6) Stay indoors; play quiet games. Going outside can be too much of an energetic overload for your child's body when sick, and may prolong and intensify the stress on his body. 7) Give your child a warm bath, several times per day if necessary, and stay with your child as much as possible. Lay low, and watch your child closely. Be mindful of cool or cold drafts when getting out of the bath. 8) Regarding supplements, it is best to stop most, if not all of the supplements that your child is taking. You will need to use your judgment in making this decision. 9) Observe your child for mental status changes (see Pediatric Checklist below). 10) Please remember that the resolution of illness can take some time. The more patience you have, the more closely you observe your child, and the more you efficiently remove the stressors in your child's environments, the greater you will impact the length of recovery for your child's illness. 11) You may need to cancel plans, stay home, and not participate in previously planned activities so your child can rest and heal at home in her own comfortable, safe environment. 12) Make the first day your child feels better a slow day. Stay home and rest for the first 24 hours that the symptoms of illness have finally abated. Try not to rush back into the daily routine of life. 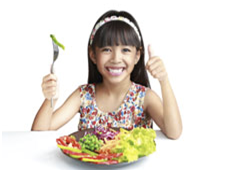 Do not force your child to eat. When children are sick, or not feeling well, their digestive systems slow down. Food is one of the last things children are interested in when they have a fever or don't feel well. Just ensure fluid intake, and don't push foods. Their bodies will tell you when they are ready to start eating again. And, most importantly, avoid sugar, including juices, flour and dairy products, and fried foods, when your child is sick, as these foods tend to increase stress, dehydration, and mucus production in the body, which will prolong, or worsen, the course of illness. It is important to eat the right kind of food for a healthy mind and body. Try to incorporate 6-7 small meals/snacks during the day.Generally, all food items can be classified into six major groups as shown in the Healthy Food Pyramid. Cut down Sugary beverages and foods. Do not add any extra sugar to beverages.